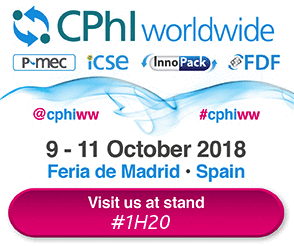 Holodiag will be present at CPhI Worldwide, held in Madrid, Spain, from October 9th to 11th 2018. We are located on the Polepharma pavilion on the ICSE International Contract Services Expo, stand # 1H20 (ICSE Hall 1). Contact us to schedule a meeting! Holodiag was present at CPhI Worldwide, held in Frankfurt, Germany, from October 24th to 26th 2017. We were located on the PolePharma pavilion on the ICSE International Contract Services Expo, hall 4.1, stand # 41D50. Holodiag celebrates the company’s 10th anniversary and prepares to enter its second decade with a multitude of new R&D, marketing and strategic projects. Since its creation in 2007, Holodiag has continuously made considerable investments in both specialised physico-chemical analytical equipment and R&D. Over the last couple of years, R&D services have become increasingly important and now take a prominent place in the company’s portfolio. Pierric Marchand, C.E.O. and founder of Holodiag, and Vincent Levacher, CNRS Research Director, jointly created CrisOrg, a research laboratory dedicated to finding new ways to obtain pure enantiomers. The laboratory recently initiated the LabCom project, a R&D program that is co-financed by the ANR, the French organisation for the promotion and advance of scientific projects.